Sticks with moulded heads; pockets with mesh, rawlon lace or synthetic lace with leather runners and wood or metal handles. 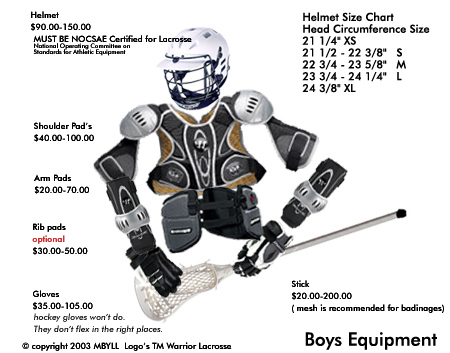 The lacrosse stick should measure not more than 116.84 cm (40"), nor less than 101.6 cm (46") in overall length, and not more than 20.32 cm(8"), nor less than 11.43 cm (4 1/2") in width. In Pee Wee and all lower divisions, the minimum length of the stick can be 86.36 cm (34"). The balls used in all matches should conform to CLA standards and beapproved by the CLA. The approved ball is the same used in field lacrosse. Lacrosse Stick with a minimum length of 40 inches.